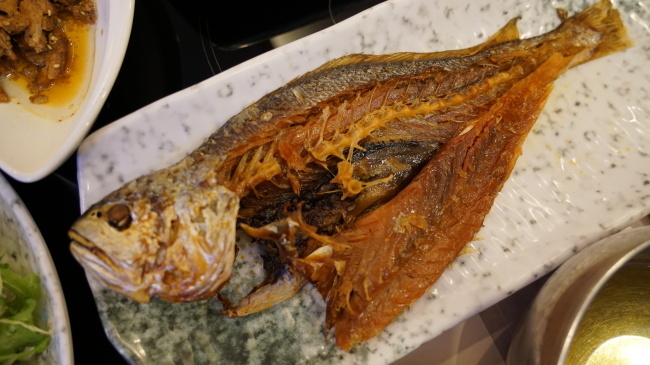 Ordering borigulbi at a restaurant, first-timers may expect barley aside the dried fish, as “bori” refers to that grain in Korean. But they will be disappointed, as not a single piece of barley will be served with the fish. Instead, a distinctive odor wafts from the table. It is a fishy smell, but not such a smell that would come from fresh fish. Borigulbi is made with yellow corvina. After the intestines are removed, the corvina is dried in wind blowing from the sea. After the lengthy process, the corvina is fermented in an earthen pot filled with heaps of barley. The smell comes from the preservation process. The bran in barley ferments the corvine, giving rise to a distinctive fermentation smell -- a stronger, saltier smell with a pungent odor. After having borigulbi, the smell even lingers on the clothes. Borigulbi is quite oily when served. The oil will be all over your hands, as one tries to debone the fish. Some places give out disposable gloves for just this purpose. Before being served, borigulbi is steamed with rice water to soften the flesh. Yet still the dried fish is tough and chewy, similar to beef jerky in texture. While chewing on the meat, the salty moisture leaks out. The dish is preferred especially when the weather turns hot, as one way of eating borigulbi is to put rice in water brewed with green tea leaves -- though much more watered-down than typical green tea. Putting the meat of the fish and rice in the cold green tea-infused water, the cool flavor is said to restore a lost appetite. On national holidays such as Chuseok and Lunar New Year, some Koreans give borigulbi in gift sets to one another. It is considered one of the most exquisite – and expensive -- gifts. Yeonggwang, South Jeolla Province, is particularly known for the fish dish. The city on the west coast boasts borigulbi as its regional specialty, thanks to its strong winds coming from the ocean -- the perfect environment to make borigulbi.